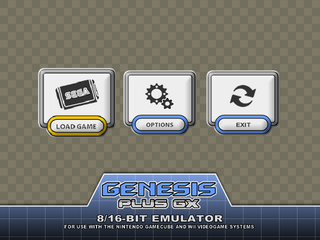 Genesis Plus GX is a Sega multi-system emulator originally for the Nintendo GameCube and Nintendo Wii, developed by eke-eke. The author claims the emulator has accurate emulation and 100% compatibility with Sega Mega Drive, Mega-CD, Master System, Game Gear, and SG-1000 games. It also has preliminary Pico emulation. The emulator was originally based off Charles MacDonald's Genesis Plus 1.2a. For Mega-CD games, ISO + WAV, BIN + CUE and ISO + OGG formats are supported; ISO + MP3 is not supported. Some versions of the emulator were backported to Windows. Genesis Plus GX is also available for a variety of systems as an emulation core of the libretro gaming API. Game Gear has an optional extended screen mode. SD card, USB drive, and DVD support. Save states and cheat files can be autoloaded. The Wiimote can be used in the place of light guns. USB mouses can be used for Sega Mouse emulation. Up to 1000 files in file directories. Using directories is recommended as it improves interface and navigation speed. Game Genie and Pro Action Replay code support. The combined cheat code max is 150. PAR codes that don't use the address and 4 values after that are automatically deleted. Example: FFFEEE:0001 is acceptable. FFFEEE:01 is not. Action Replay codes generated by Gens Hacking Version also work on Mega-CD games. Gens/GS is another emulator that also supports Mega-CD cheat codes, but only for the main 68000 address space. Versions WIP 0, WIP 1, WIP 1.1, WIP 1.2, 070207, 070309, 070317, 070322, 070326, 070411, 070508, 070518, 070621, 071228, 080419 GC missing.